A reliable microwave, with a unique space saving design. No real weaknesses. 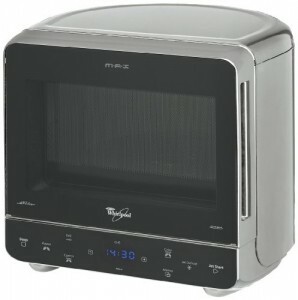 After a compact yet reliable grill microwave? The silver Max 38 Crisp from Whirlpool may be the answer - featuring 750w of power and a modest 13 litre capacity. Despite it's relatively small capacity, this model still sports a substantial 28cm turntable - thanks to it's well designed curved back panel. This space saving design means that it is an ideal corner unit microwave, which will save precious kitchen space. It features five different power levels, going up to a maximum of 750w, as well as a handy grill facility to help leave a crisp finish to meals. The controls are well labelled, and are situated below the door of the microwave - this helps keep the footprint of the microwave relatively small, thus saving you further room. The display is LED based, and also provides a handy 24 hour clock. This particular silver microwave oven is available in a range of colours - this silver one being perhaps the most subtle, and our test teams favourite. 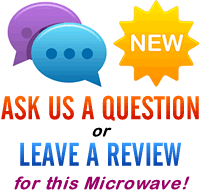 Overall build quality is very good, and it feels like it will offer years of service. Looks smart, is well built, and feels like it will offer years of use. Available in a range of colours - we liked this silver one.